Why Shuttlelift? Because Shuttlelift has answers for the most unique lifting questions. “Too heavy a load- too tight a turn – too rugged a terrain” our complete line of Shuttlelift rubber tired gantry cranes is designed to solve the toughest lifting problems. Tailoring the right equipment to your specifications takes more than checking a box. At Shuttlelift we partner with our customers to “walk the yard” enabling us to determine traffic flow, terrain, and building clearance. From there we discuss load capacity, material handling, mobility and safety specifications. Every challenge is unique, so we design your Shuttlelift accordingly. Each mobile gantry crane is created to perform to every situation you plan to throw at it. We are always developing new crane technology and value customer-inspired design features that give us a unique competitive advantage. Our full line of rubber tired gantry cranes come in several configurations, control systems and performance options. Let us walk you through our “Crane Spec” process and discover what “innovative lifting solutions” truly means. The DB Series high-quality performance, efficiency and adaptable design were built for long-term, heavy duty cycle use. With double traversing beams, our DB series will increase efficiency and productivity without increasing the price. Let us develop your customized lifting solution to help save you time and money. 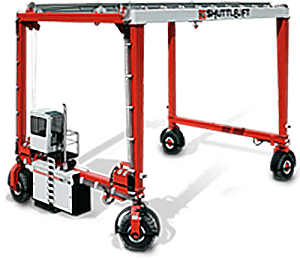 When it comes to tandem picking long loads, nothing surpasses the ease of use or economy of using the Shuttlelift SB series to perform the task, whether using a pair in tandem or one in conjunction with a conventional gantry crane. The SB series opens all of your real estate as usable space. The SB series gives you the versatility to use the crane inside of your facility and the ability to carry the parts outside of the building anywhere in your yard for staging or loading out for shipment. Designed specifically for “pick and carry” operations, the SL series will increase your productivity with an economical solution. Whether you are performing a “pick and carry” operation or loading a truck for transport, using the simple independent hoist system makes this task a breeze. When terrain becomes an issue in your operation, the ISL series is best suited for you. With its five beam upper structure and articulated Pivot Trunnion, the ISL series can move material over rugged terrain. It also has the ability to traverse a load both vertically and horizontally with two independent hoist controls and two independent traverse controls.